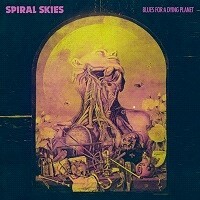 After releasing a successful EP titled "A Queendom to Come" in 2015, and "Event Horizon" single in 2016, the Swedish Psych doom rockers "SPIRAL SKIES" are back with a full-length album. It all starts with an organ driven intro with winds, strange mood, spooky ambiance, powerful organ called "Black Hole Waltz". Then we head for the first track, sounds like NWOBHM, IRON MAIDEN etc, but don't get fooled: the mood is suddenly changing with Doomy guitars and while Frida starts singing we move to different horizons. Pretty nice and catchy music. Frida's voice reminds me a lot of Grace Slick. I wish i could ask Frida if Grace is a big influence. That's a great thing since i really like JEFFERSON AIRPLANE look for "White rabbit" song if you're curious, it is very cool and dark for 1967. The vocals harmonies sounds really 70'S and its very interesting. This song makes me want to ride on the highway on my way to freedom!I really dig it! Think 80's English metal, with 60's psychedelic influences, 70's guitars and mood. Psychedelic Heavy Doom occult rock?! "Dark side of the cross" begins with a "Sabbathic" riff just to tease and we're in for another ride into their realm. Frida's singing is very 70's. The backing vocals gives a very rich depth to the song.The chorus is catchy and the bass line quite moving. The guitars is creative and makes many variations and never get caught in dull patterns. I'm charmed.If you like Canada's Blood Ceremony, you'll like it. "The wizard's Ball" starts it up with some great bass intro to let us being charmed by Frida. Dark ambiance, more smooth song, with power choruses, and a haunting feeling, hypnotic and seducing vocals. It sounds like some old CANDLEMASS a little with his own signature. I hear Messiah or Rob Lowe singing it along , wow that would be great as f……!!!!!!! "Danse Macabre" is a visit to spooky town. Very theatrical, burlesque, strange and inviting but a little terrifying at the same time. It really fits the song title, and is simple but effective. "Labyrinth of the mind" has a little stoner style in the riffs, lightly.More rock than metal here. Frida's tells stories from other times other places maybe other worlds. It's a journey through many territories even uncharted ones. They have their signature their style. We can easily recognize them after only a few songs, and that's a great thing. I don't feel like they're exploring or trying to defines themselves. They know where they are going. "Shattered hopes" is quite a good song, if you'd like to hear what Janis Joplin would sound in 2018, there it is. I can't help thinking about her in this one. Maybe Frida time traveled? If so, I believe her. "Left Is Right And Right Is Left Behind" got a classic metal riff approach. A little headbanging is always welcome. The drumming is quite good. The way the vocals and guitar are recorded adds a lot to the experience.T hey did a superb job. We leave the modern world to get trapped into outer space and time.We can't tell where we are but it feels right.Vocals harmonies are overwhelming here. Now for the last one "The Prisoner" we have a very proggy synth filled intro. This album finisher is quite interesting and is a powerful hybrid of JETHRO TULL and URIAH HEEP like. We can hear the influences easily. That's so good i will get a hand on a LP soon. What a great album it is, refreshing while being revisiting 70's, 80's and adding a glimpse of modernity. AMAZING ALBUM.